← Fill Your Plate with Avocados! You may recall that Arizona citrus is one of our state’s five “C’s.” Lemons is right in there with the rest of the citrus our state produces. And while you’ve seen citrus acres decrease in our state over the decades we still have a story to tell about our Arizona lemons, especially since most of our lemon production is coming out of Yuma Arizona. 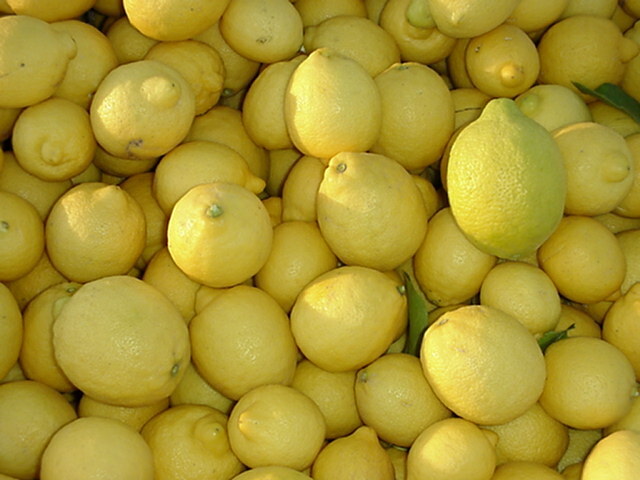 California and Arizona produce 95% of the entire lemon crop the United States enjoys each year. So, lemons are an important part of the mix of agriculture in our state. The following list of lemon facts will help us appreciate the fine fruit even more. As we all know, lemons are rich in vitamin C.
The typical lemon tree can produce fruit all year round and can produce up to 600 pounds of lemons every year. This tangy citrus in native to Asia. Lemon zest, grated from the rind, is often used in baking. The leaves of a lemon tree can be used to make tea. The average lemon holds three tablespoons of juice. The average lifespan of lemon trees is over 50 years. With proper care and disease prevention practices, a vigorous tree can live more than 100 years. One whole raw lemon contains 139% of the daily recommended vitamin C intake and has 22 calories. This entry was posted in Arizona, Cooking, Fill Your Plate, Food, Food Production, Grocery, Health Tips, Healthy Eating, Planting, Produce, Recipes and tagged agriculture, Arizona, facts, lemons, local, recipes. Bookmark the permalink.